No Multimedia Codec For Linux Mint 18 + How to Install It? Please know that Linux Mint 18 drops multimedia codec for their ISO image based on Linux Mint Monthly News. Multimedia codec is very important features for some people to play audio and video file format on Linux such as play mp3, dat, avi on Linux Mint. Unfortunately the developer of Linux Mint looks like follow the Linux Mint package based (Ubuntu) in order not to include the multimedia codec into their ISO image. or during the installation process, by clicking a checkbox option. So you still can play mp3 file during the live session from DVD. For your information, if you have a problem with Asus laptop with Linux Mint, now on Linux Mint 18 everything will work perfectly. A media player based on totem, called xplayer. A text editor based on pluma, called xed. A picture viewer based on eog, called xviewer. A document reader based on atril, called xreader. Linux Mint 18 may satisfy their user and bring new innovation to the desktop operating system from freedom came elegance! Screenshot above show that Linux Mint 18 Sarah will beauty and fast enough. 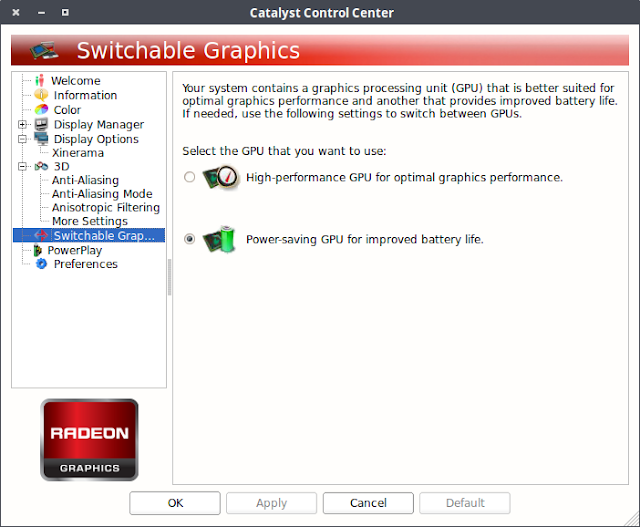 AMD/ATI Catalyst Linux Driver Download (All Version) --Download the AMD Radeon Software Linux (drivers for Radeon, FirePro, APU, desktops, laptops). Before choosing a driver to download you need to determine if you need to install, reinstall, or update the current driver. The steps of driver installation depend on your software package, please see How to install Apps on Linux for clear tutorial of installation. NOTE: If you previously install AMD ATI driver, please consider to uninstall the driver first then do an update for the driver. Updating the graphics driver is not required even though a newer version is available. If there are no issues with the performance of your system, software, and graphics hardware, then updating the graphics driver is not recommended. Now that the reasons to install/reinstall or update a graphics driver have been covered. Let us explore the available methods for locating a compatible driver on the AMD website and understand when and why to use each method. Where to Download AMD ATI Driver for Linux ? All Linux version such as Linux Mint or Ubuntu has same flavor because Linux Mint derived from Ubuntu. 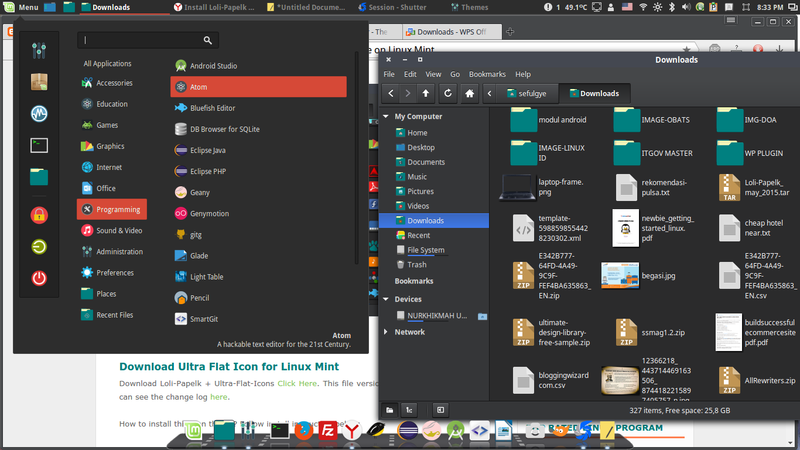 Since Linux Mint has better looks it makes Linux Mint very popular for home and office daily use. Linux Mint offer a standard pre installed software that you need from the music multimedia to office suite, but it has standard driver which come by default. APU (Accelerated Processing Unit): These are processors that combine the CPU and the graphics processor (GPU) on a single chip. APUs are commonly used in desktop PCs, mobile notebooks, and workstation systems. The AMD A-Series APU is an example. Desktop Graphics: This technology is commonly used in home desktop PCs. The AMD Radeon™ HD series graphics cards are examples. Notebook Graphics: This technology is typically used in notebooks/laptops. The AMD Mobility Radeon™ HD series graphics cards are examples. TV Tuner Products: This refers to devices that allow desktop computers and notebooks to receive live broadcast video and HDTV content. AMD TV Wonder™ 750 series tuner cards are examples. Workstation Graphics: Workstation graphics technology is commonly found in computers used for business purposes. They are designed for use in the Computer Aided Design (CAD), Digital Content Creation (DCC) and simulation markets. AMD FirePro™ series graphics cards is an example. Integrated Motherboard Graphics: These graphics components are integrated into the motherboard of a computer system. The AMD Radeon™ HD4290 series graphics cards are examples. Embedded Graphics: This graphics technology is found in products built to deliver the high performance of desktop graphics for embedded applications often found in smaller form or thin clients. AMD 785E and AMD 780E graphics processors are examples. MAC Graphics: These are graphics products used in MAC computers. Apple Boot Camp drivers can be found in this product category. If you have to choose one, which one do you prefer.. .Should you Choose Linux Mint Mate or Cinnamon or XFCE or KDE ? Find the answer and comparison here! Todays Linux Mint distributed under the 32 bit and 64 bit version with different desktop environment version such as Cinnamon, Mate, KDE, and XFCE. When you need to install the Linux Mint which one you should choose? 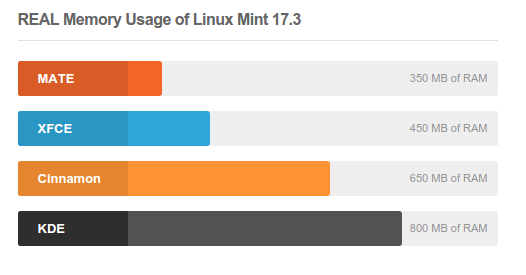 Linux Mint MATE is consuming a very low usage of memory. This is the best choice for programmer who run heavy program such as Android Studio, Eclipse, and soon which need to debug the developed apps. XFCE version is suitable for old computer. This version using Panel and Start Menu looks like Windows XP in classic mode. Cinnamon version offers animation, effect and thumbnail view looks like Windows 7/8, This is the best choice for daily usage for home and office because its interface similar to Windows 7 or 8. If you want an interface similar to Windows 10 then you have to choose the KDE version but it consuming much memory. Linux Mint with KDE plasma is the best choice for computer or laptop with the high specification. 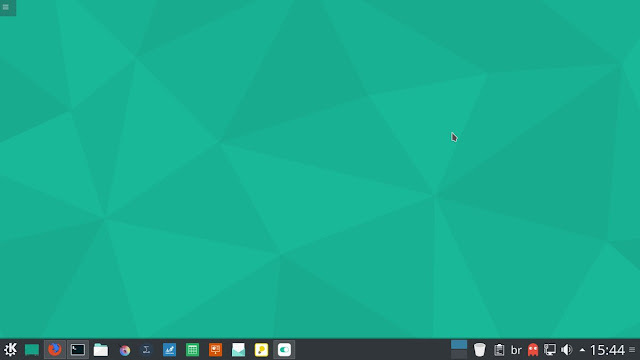 We can say that this desktop environment looks like Windows 10, and for daily use we recommend you to use Cinnamon version for modern computer. Your Linux will run perfectly! Linux Mint Mate is suitable for programmer who run big and heavy application. XFCE is suitable for old computer. The Cinnamon is suitable for daily use for todays computer. To use KDE please make sure you are using the high specification device! 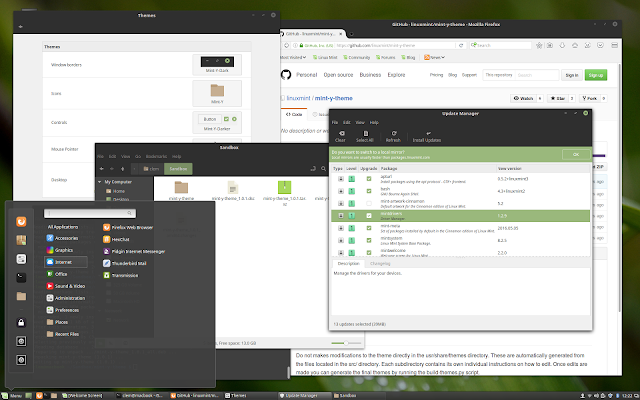 Understanding The Part of Linux Mint Cinnamon Desktop Environment workspace. Here will be explained the Cinnamon desktop parts so you know the parts name of the Cinnamon desktop environment on Linux Mint. Because the Cinnamon desktop environment intends to implement a different graphical user interface (GUI) than the GNOME desktop environment, many of the GNOME Core Applications were forked, so that this Linux Mint GUIs can be rewritten appropriately. 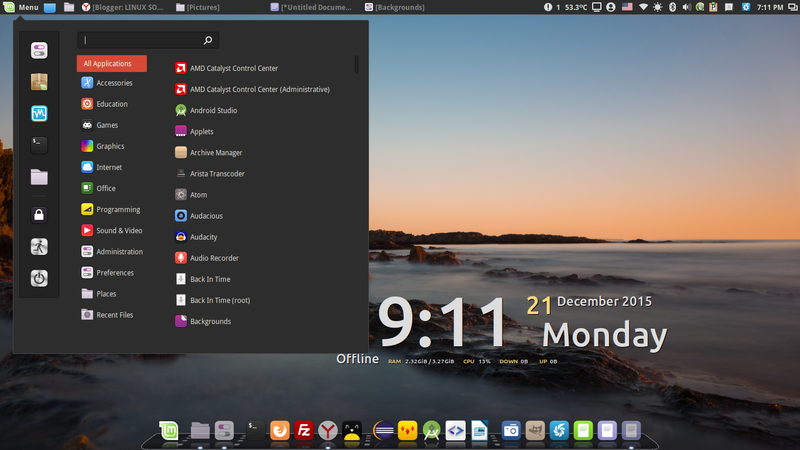 Cinnamon is a desktop environment that is based on the GTK+ 3 toolkit intended to Linux Mint distribution. The project was originally started as a fork of the GNOME Shell, i.e. 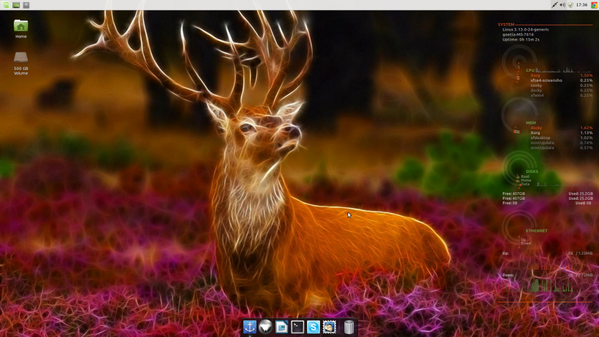 a mere graphical shell, but became its own desktop environment in Cinnamon 2.0. Cinnamon workspace is a desktop on Linux Mint which is contain Panel (including start menu, show desktop, files, applet, etc) and desktop background. 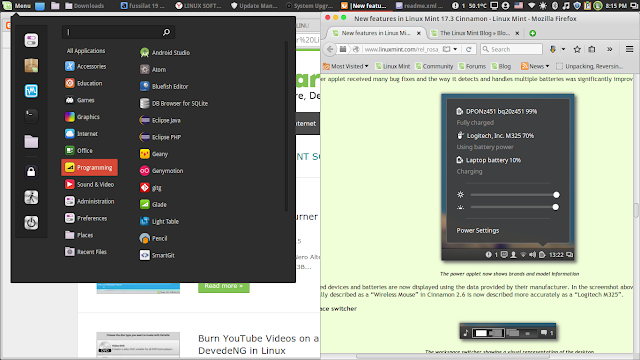 You can add Linux Mint workspace if you want so you have two desktops or more. For Linux Mint user with Cinnamon desktop, you can switch between workspace by pressing Ctrl + Alt + Right Arrow on the keyboard. Cinnamon's Start Menu give a familiar user experiences and it categorize the Linux apps based on their functionalities such as Accessories, Education, Games, Graphic, Internet, and more. This "Show Desktop" features is similar on Windows 7. So if you click on the "Show Desktop" indicator icon...all opened applications will be minimized into Panel and you will see your desktop background. "Files" provide quick access to your file manager. This features similar to "explore" on Windows 7 so you will see your file manager, for Linux Mint you will see Nemo. List of active or opened application will be available here! From the opened apps, you can do a right click on them in order to close application, minimize it, maximize it, or moving it into another workspace. As mentioned above you can see all program you have opened by pressing Ctrl + Alt + Down Arrow on your keyboard. Panel is a place which contain all of opened program, start menu, show desktop, applet, etc. In a Linux workspace contain panels, and in a panel contain applets and his friends. You can add more than one Panel in a Linux workspace! Cinnamon applet is an indicator from specific program which is placed on the Panel. 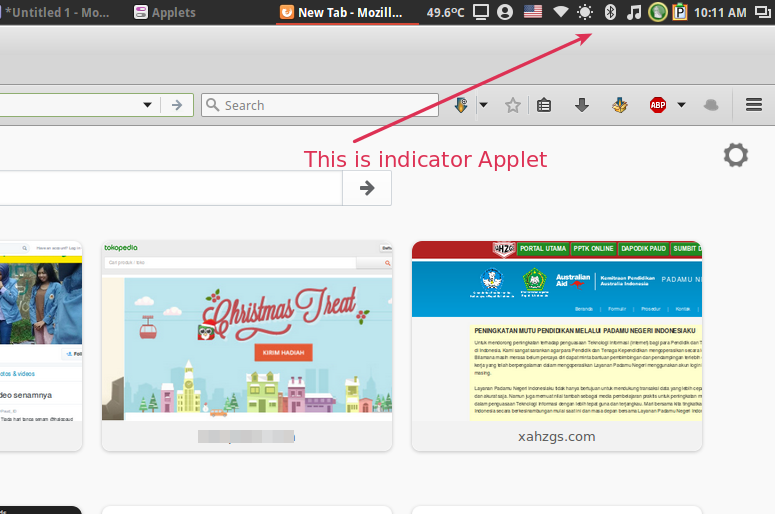 The Cinnamon indicator applet is very useful to manage your system or to notify you about something. You can add Applet as you want from the Applet setting window. Some default applet included are sound applet, power applet, workspace switcher, and many more. Conky is not part of Cinnamon but it is shown on the picture so we explain here. Conky is a Linux program which is developed to show information about the network speed, system date, real time memory usage, weather, and soon. This is very useful apps. Cairo Dock is also not the part of Cinnamon workspace. 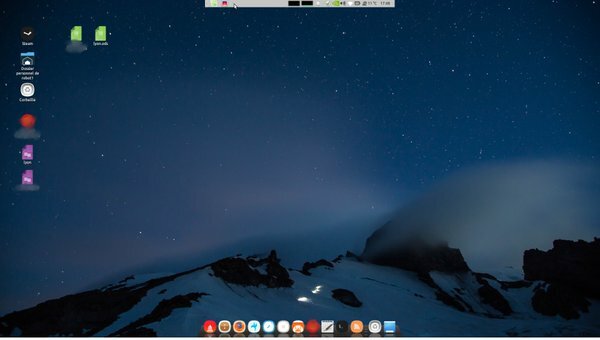 The Dock will provide a quick launch to your Linux program. This program inspired from Dock on Mac OS. Hope this article is very informative. Please share folks! How to manage auto start applications on Linux Mint? Managing Linux Startup Applications to Make Linux Mint Faster. This guide will show you to configure Startup Applications to manage listed start up program so you can speed up your Linux Mint. If the Windows operating system has the Startup folder which you can easily place any shortcut to a program that we want to launch automatically. In Linux Mint there is a way easier way to manage startup applications using a program called Startup Applications. 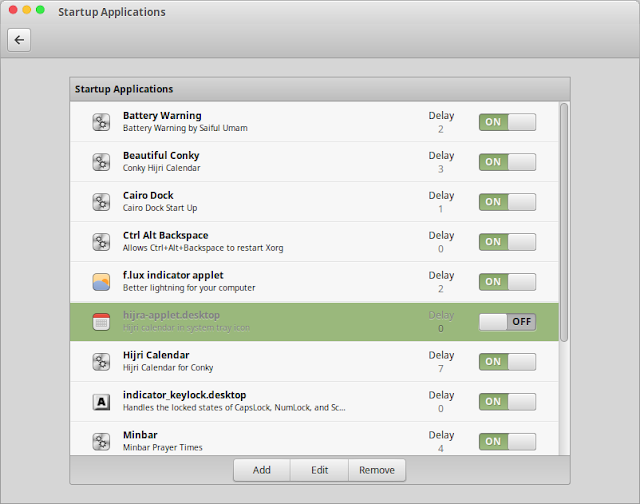 Startup Applications is The Linux Mint programs installed by default which can manage start upp application. To Open Startup Applications on Linux simply click on Start Menu >> Preferences >> Startup Applications. A window of the program will show up then you have the option to enable or disable existing entries, edit or delete them and to create new ones - click on Add to do so. You can add, edit, or remove any startup program which is not useful to speed up your Linux Mint. 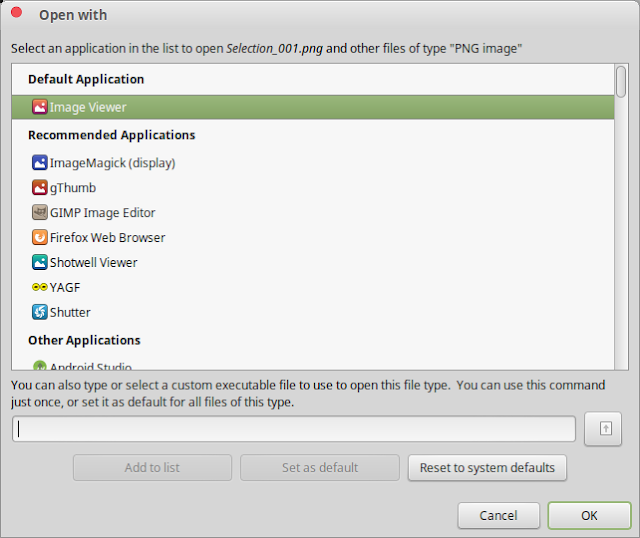 Ways to add startup application on Linux Mint is click "Add" button such as image above then select "Custom command"
Name: Enter the name of the entry that will be shown in the previous menu. Command: Enter the terminal command that launches the program you want to start. You can also browse a program or script to start with Linux when computer starts. Comment: Enter the comment that will be shown below the name in the previous menu. Enter what ever to remember you. Startup delay: the time delay in second to launch the program. You can adjust the time so that all startup program not run simultaneously. Click Save button to make a changes. 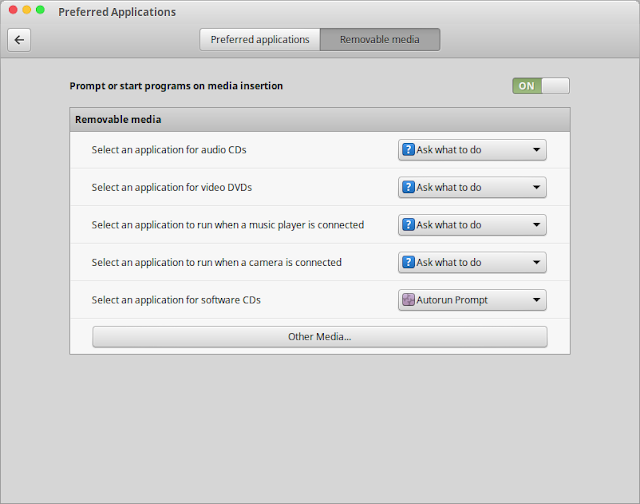 Ways to change default program on Linux, Choose the Apps Linux Uses by Default with Preferred App on Linux Mint. A default program is the program that Linux Mint uses when you open a particular type of file, such as a music file, an image, or a webpage. For example, you might have more than one music player app installed on your PC. You can choose one of them to be the default app that starts whenever you open a music file. On the "Preferred Applications" tab you can make changes to default program on Linux. Here you can configure which program to open website, mail, text editor, music file, video file, photo, and Terminal which is used. You can select your program from drop down lists as you want. Please select a program which is light and consuming less memory and CPU. 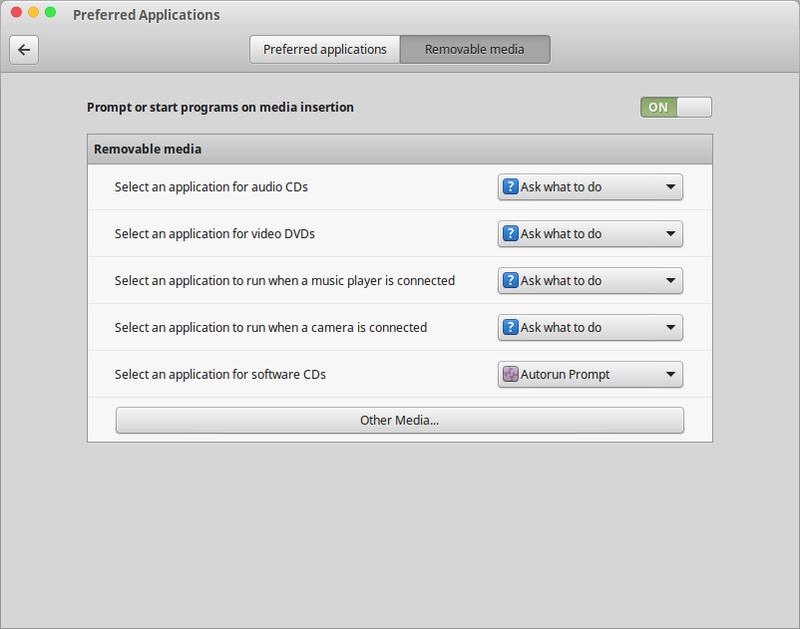 This "Removable media" tab on Linux allow you to configure removable media behavior on Linux Mint. You can also disable auto run program on Linux by make the prompt become OFF. Okay guys there is no OK or Apply button here. Just select configuration as you want and it will apply to your system. Now you can set any program you wanted, to open the file. You should know which program do you used to open so that your program will not crash. 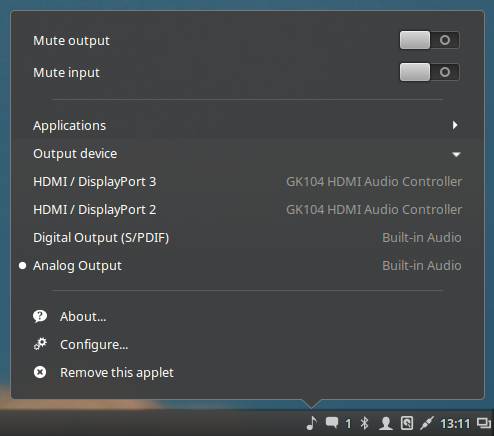 Ways to Configure Panel Looks and Applet on Linux Mint 17.3 Rosa Cinnamon. This guide will show you how to configure Panel on Linux Mint also how to add applet to Panel on Linux Mint. Panel is called by task bar on Windows operating system where the opened program placed. With Linux Panel you can access your application easily. This Panel definition is not related to web hosting panel on the server. The Panel on Linux Mint contains start menu, show desktop, file browser, applet, time and date, and list of running Linux apps. 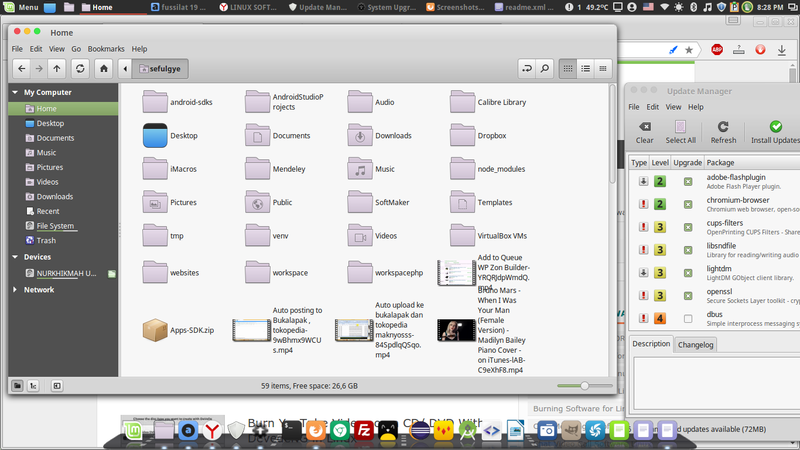 You can change the Panel looks on Linux Mint by changing the desktop themes. So if you changed the desktop theme it will automatically change the Panel looks too. Have a try! Linux Applet is a Linux Mint indicator and showed as icon on the Panel. With this indicator applet your work more easier than before. Linux Mint has so many indicator Applet which is very useful for daily use such as system temperature, display computer to projector, user applet, language, Wi-Fi setting, contrast, bluetooth, music, and may others. Installed applets tab contain applets which you have installed or installed by default by your system. The Available applets (online) is the online applet which is ready to download and install, please make sure you have an internet connection to to this. 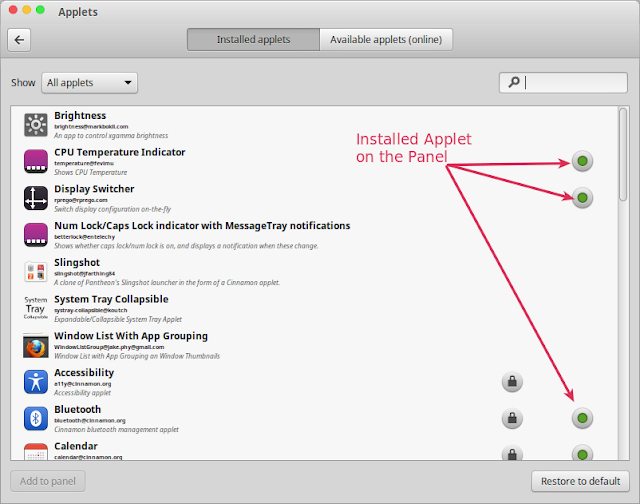 Back to "Installed applets" tab, now you can see green mark which has mean that the applet is added into the Panel. You can customize the Applet from this window. Click on the "Available applets (online)" tab, give mark on the Applet you want to install and click "Install or update selected items" button. Wait until download completed. It will be automatically installed on your Linux operating system. Once you have finished downloading applet, you can applet to the Panel by using "Installed applets" tab. Click on the Applet you want to add to the Panel and click "Add to panel" button. Done! 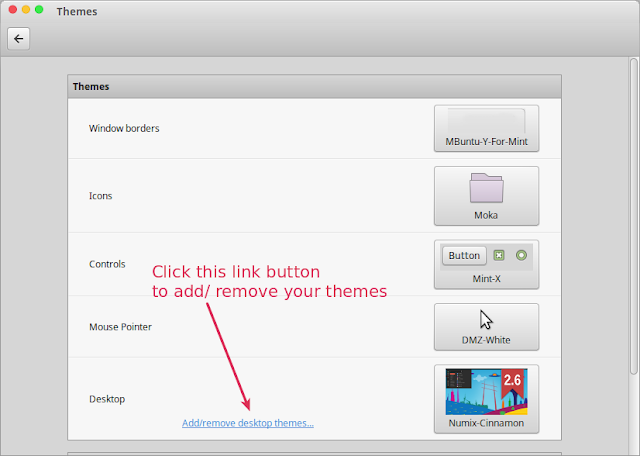 Ways to Change Linux Desktop Theme - Changing Linux Theme. This guide will show you how to change desktop appearance on Linux Mint 17.3 Rosa Cinnamon version. For this tutorial we are using Linux Mint 17.3 Rosa Cinnamon desktop. If you have not configured it otherwise already, everything should work for you. Below the Desktop section you can see a link called "Add/remove desktop themes..." click on it. Available themes (online): means that you need to download the themes you like so that it is ready to use by your Linux Mint. Another option to download Linux Mint Desktop themes is download it manually or your friend have a good looking theme you can copy it. 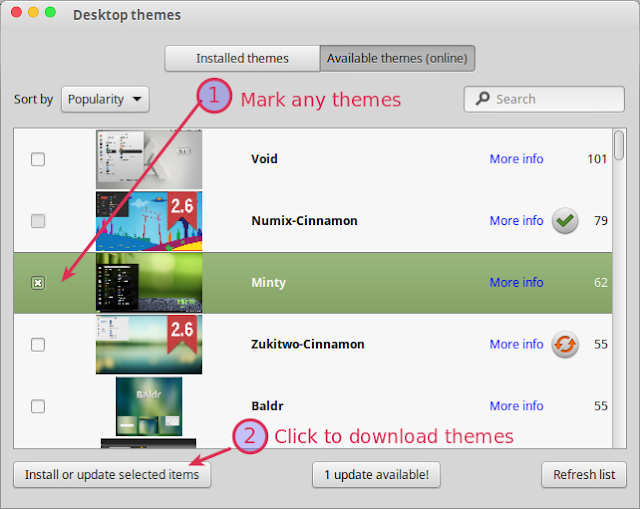 Download Linux themes manually Click Here! NOTE: We do not recommend downloading theme manually. 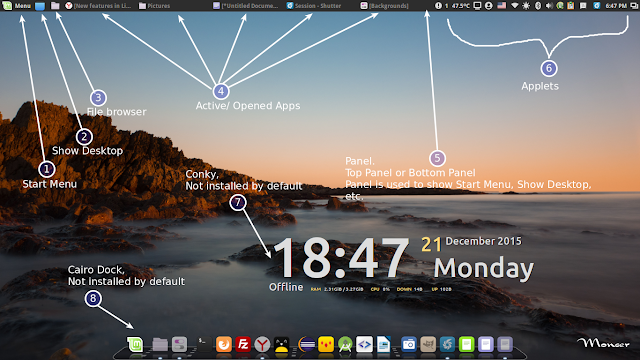 If you are using "Desktop Themes" window above to download your Linux desktop theme, you don't need to install because it is installed automatically by your Linux system. If you are using manual method, usually install instruction of your theme will be included on the readme file. Go back to main window of "Desktop Themes" above, or you can access it by clicking Start Menu >> Preferences >> System Settings >> Themes. 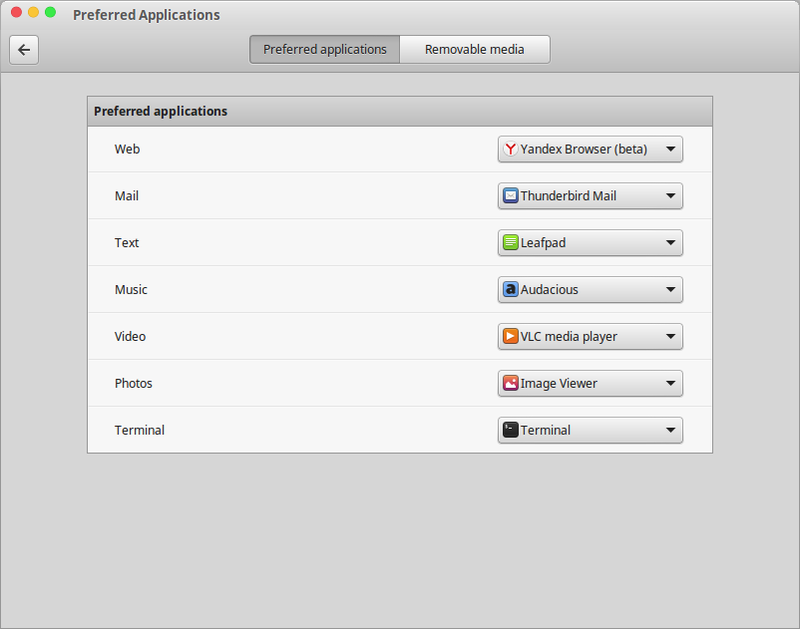 From displayed window, you can change window border, icon, control, mouse pointer, also desktop themes for Linux Mint. 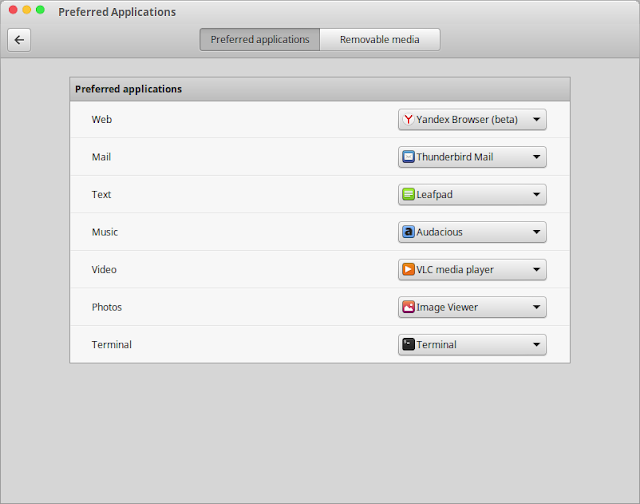 Select the "Desktop" section and click on it you will see installed theme which is ready to be used. After selecting one of your Linux themes, you can see the change. Please open your Start Menu and you will see the change. Choose the Linux themes that suit for you. Linux Mint 17.3 Rosa Released See What's New Here with review. Linux Mint 17.3 is a long term support release which will be supported until 2019. It comes with updated software and brings refinements and many new features to make your desktop experience more comfortable to use. Software repositories are mirrored (i.e. duplicated on many servers) all over the world. The main goal of the Software Sources configuration tool is to make it easy to find the best available mirror for you; one that is: Reliable and fully up to date and Fast and responsive. The Update Manager now also performs more checks than before. It warns you if the mirror you're using is not up to date. The Driver Manager is more robust than before. It refreshes the cache before looking for drivers and reports update and installation errors if appropriate. Drivers are now sorted by status and the Driver Manager now indicates if drivers are Open Source or not. Linux Mint 17.3 features Cinnamon 2.8. Click Here too see a quick video showing some of its new features. Sound applet: The sound applet was given a fresh new layout. The track information and media controls are now part of a new overlay which sits on top of the cover art. In addition to traditional status icons, the Cinnamon system tray now also supports indicators. If you don’t like indicators, you can turn this off in “System Settings” -> “General” -> “Enable support for indicators”. This results in forcing all applications which use indicators to fallback to using status icons. How to Upgrade Linux Mint 17.x to Linux Mint 17.3 Rosa. 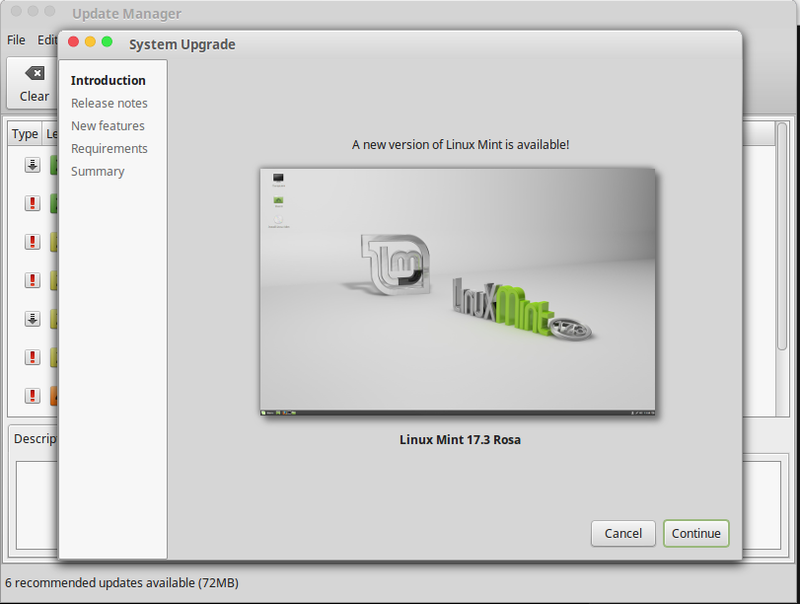 This guide will show you how to upgrade Linux Mint 17 Qiana, Linux Mint 17.1 Rebecca. Linux Mint 17.2 Rafaela, to Linux Mint 17.3 Rosa. Ordinarily the best way to go from an older Mint version to a later Mint version, is to apply a clean upgrade. Which means: format the hard disk partition on which the older version resides, and install the later version cleanly on the empty partition. The reason for the change is, that Linux Mint currently uses only LTS versions of Ubuntu for base. Within a Mint series that's always the same Ubuntu version, so the upgrade to a later Mint within the same series is technically no big deal. That has changed: upgrading within a particular Mint series, has become a lot easier. Namely by upgrading the older version to the later one. Do these following step to upgrade your Linux Mint 17.x to the latest Linux Mint version. Open Update Manager by clicking Start Menu >> Administration >> Update Manager. You will see the window of Update Manager. Wait until download completed! It will install upgrade package automatically. You can reboot your machine after install to see the change. Note: during the upgrade you won't get a kernel upgrade to the recommended kernel for Linux Mint 17.3 Rosa. There's a reason for that, because that's no problem: it's quite alright to continue using your current older kernel in 17.3. You're done. Enjoy the beautiful Linux Mint 17.3 Rosa! Linux Mint 17.3 Rosa been released. See Linux Mint 17.3 Rosa Review also official Linux Mint 17.3 Download Linux for Stable Version of Linux. 512 MiB of RAM (1 GiB is recommended). 9 GiB of disk space (20 GiB is recommended). DVD drive or USB port to install Linux. You need to burn your ISO file of Linux Mint you've downloaded into DVD using K3b or USB using Unetbootin. Select your Linux architecture, is 32bit or 64bit. Below is the link for downloading Linux Mint 17.3 Rosa Cinnamon official. Linux Mint 17.3 Rosa Cinnamon Released With Cinnamon 2.8 Download. Linux Mint 17.3 Rosa also has long term support release which will be supported until 2019. It comes with updated software and brings refinements and many new features to make your desktop even more comfortable to use. Linux Mint Cinnamon is available with better window management. It supports for multiple monitors was significantly improved. The mapping of new windows, dialogs, OSD info (such as the workspace names) was reviewed to make sure everything appeared in the right place and on the appropriate monitor. The release notes provide important information about known issues, as well as explanations, workarounds and solutions. See Linux Mint 17.3 Rosa Review With Video Click Here. To upgrade from the BETA, simply launch the Update Manager and install any Level 1 update available. 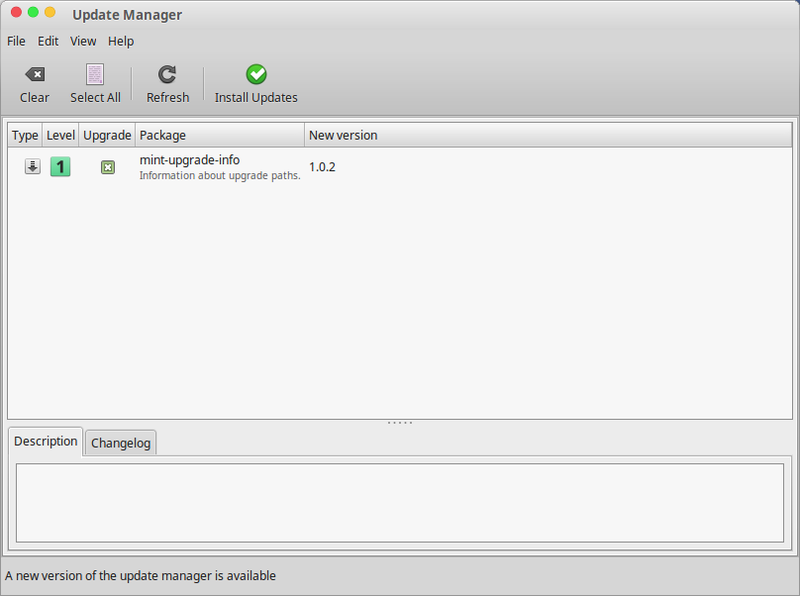 To upgrade from Linux Mint 17, 17.1 or 17.2, please use Update Manager. Click Here for Upgrade Instructions.